WASHINGTON (AP) — French President Emmanuel Macron urged the United States to reject fear and isolationism Wednesday and instead embrace the historic bond between the two countries to launch a new era of 21st century leadership and security. Macron told a joint meeting of Congress, "the American and French people have had a rendezvous with freedom." Speaking almost directly to President Donald Trump, Macron quickly turned to the top issues of Syria, the Iran nuclear deal, free trade and the Paris accord on climate change — topics where he and Trump disagree — as he urged the United States not to retreat from its historic and military role in world affairs. "We are living in a time of anger and fear" because of "global threats," Macron told lawmakers. "You can play with fears and angers for a time, but they do not construct anything." With a nod to great American leaders, including former President Franklin Roosevelt, he warned against withdrawing from the world in fear. "We have two possible ways ahead. We can choose isolationism, withdrawal and nationalism. It can be tempting to us as a temporary remedy to our fears," he said. "But closing the door to the world will not stop the evolution of the world." He proposed a "new breed of militarism" that was more effective, accountable and results-oriented. "This requires more than ever the United States involvement," he said. At times during the nearly hour-long speech, delivered in English, he took turns playing into his friendly relationship with Trump, while nudging, forcefully at times, against their differences. He reiterated French support for U.S. sanctions on Pyongyang toward the denuclearization of the Korean peninsula, and said as for Iran, "our objective is clear: Iran shall never possess any nuclear weapons." But he warned against simply abandoning the multi-nation Iran nuclear deal, as Trump has considered, promoting a "more comprehensive deal" he has been discussing with White House officials during his U.S. visit. In a nod to what Trump calls, "Fake News," Macron warned that lies disseminated online are threatening freedoms worldwide, and in a play on Trump's famous campaign slogan, Macron said he was confident the U.S. will re-join the Paris climate agreement. "Let us work together in order to make our planet great again," he said, "and create new jobs and new opportunities while safeguarding our earth." If Earth's climate continues to warm, "there is no Planet B," he added. 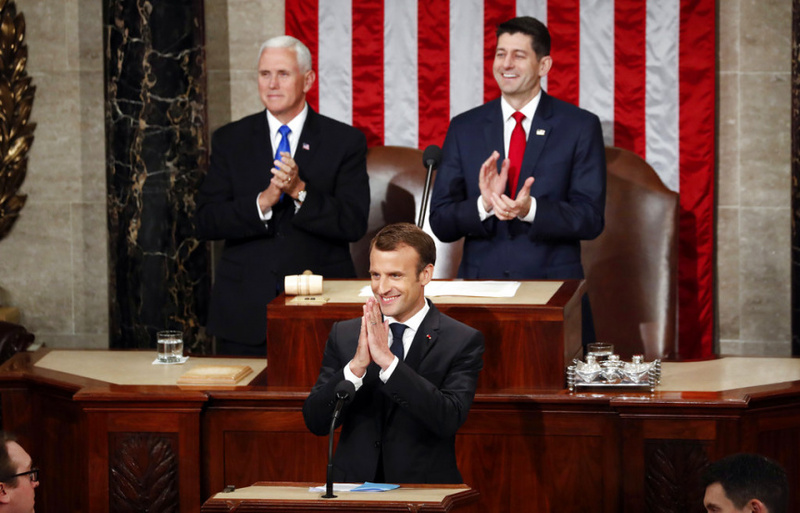 The independent centrist president, who does not always receive such a robust welcome at home, was greeted with repeated standing ovations from members of Congress — including Republicans, who have not always aligned with French leaders on policy. In recounting common bonds from the earliest days of the United States, Macron talked about a meeting between Ben Franklin and the French philosopher Voltaire, "kissing each other's cheeks." In an apparent reference to his friendly meetings this week with Trump, he said, "It can remind you of something." Macron was speaking as part of his visit to the United States. It's the first time a president from France has addressed Congress in more than a decade, but follows a tradition of foreign leaders appearing at the U.S. Capitol.